The VIP demo for Anthem, the hotly anticipated Destiny-but-Iron-Man-shooter-roleplaying-online thing from Bioware, is now live — and I had the chance to try it out. Was it fun? Certainly. But there are a few issues that make me think you should keep your wallet in your pocket. At least for now. Let’s start with the good. 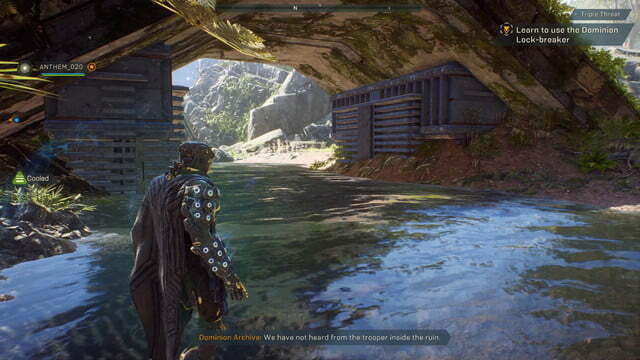 Anthem is gorgeous. Comparisons to Destiny are not unwarranted, but Bioware has used the Frostbyte engine (built by DICE for the Battlefront and Battlefield franchises) to drastically amp up the level of detail. Destiny’s art direction is fantastic, but the worlds are relatively sparse. Anthem goes the other direction, packing levels with gobs of detail, from foliage, to rocks, to the little dents in your Javelin exosuit. It’s easily among the most attractive games I’ve laid eyes on. Everything works, from the grand vistas to the minute details of character animations. No, it’s not perfect, but the presentation is damn fine overall. Unfortunately, that takes a toll on your video card. Even our RTX 2080 Ti, stuck in a system that has an AMD Ryzen 1950X processor and 32GB of RAM, could hardly keep up. Here’s how it faired. 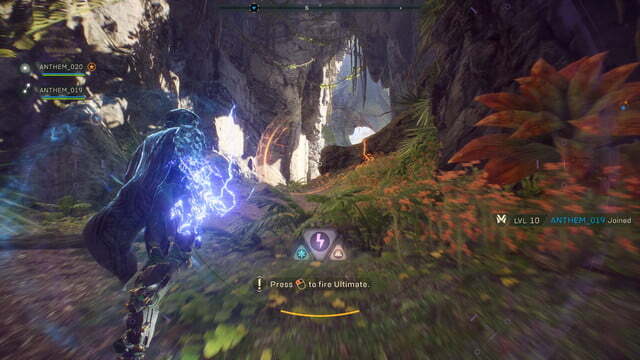 I’m disappointed that Anthem failed to crack 60 frames per second at Ultra detail at any graphics preset or resolution. As mentioned, this game uses the Frostbyte engine from the Battlefield series, and those games are ridiculously well-optimized. Yet this problem isn’t a surprise. Past Bioware games like Dragon Age: Inquisition and Mass Effect: Andromeda have also struggled with mediocre performance. High is a better preset for those who want to see the best combination of performance and visuals. It ups the performance to 60 FPS at 1080p, or 54 FPS at 4K. If you’re wondering why those performance figures are so closely packed despite big leaps in resolution, well, you’re not alone. Increasing the resolution did not reduce framerates as much as I expected, and I couldn’t find an in-game explanation. Usually, this points to a CPU bottleneck; the Ryzen 1950X in the test system has mediocre per-core performance. 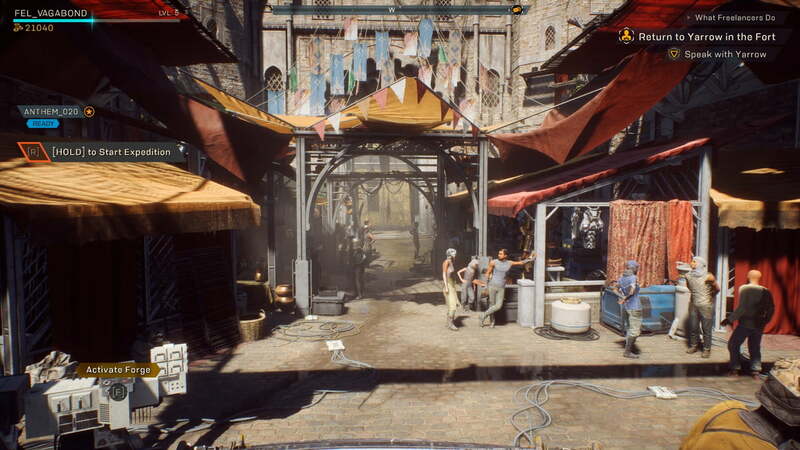 Anthem was playable at any setting, but remember – it was powered by an RTX 2080 Ti. Battlefield 1, played on the same test system, hit 107 frames per second at 4K resolution and Ultra detail. Anthem is a demanding game that’ll pose a serious challenge to mid-range hardware. I’ve also tried the game with other graphics cards, including an Nvidia GTX 1080 Ti and an AMD Radeon Vega 64. Neither card was able to achieve better than 60 FPS at Ultra detail and 1080p. The Vega 64 had a really rough time, hitting only 29 frames per second on average. Frankly, I’m not entirely confident in any of these results due to wide variances in performance based on scene, level, and activity — and that lack of consistency is an issue on its own. A few indoor sections spiked the framerate as high as 80 FPS at 4K and Ultra detail, while others dragged performance into the high 30s. Performance varies in every game, but Anthem bucked and darted like a wild stallion. Early access issues, or real bugs? I started to test the VIP Demo on a Nvidia GTX 1060, too, but only completed one test run before I ran into an infinite load screen bug. This same problem occurred with the RTX 2080 Ti several times, but with the GTX 1060, it became a permanent obstacle. The open demo was more stable, but I still ran into the infinite load screen bug twice, once with the Nvidia RTX 2080 Ti and once with the AMD Radeon Vega 64. 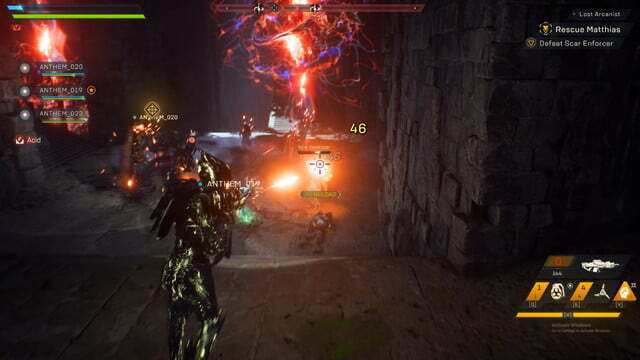 Anthem is a demanding game that’ll pose a serious challenge to mid-range PC hardware. 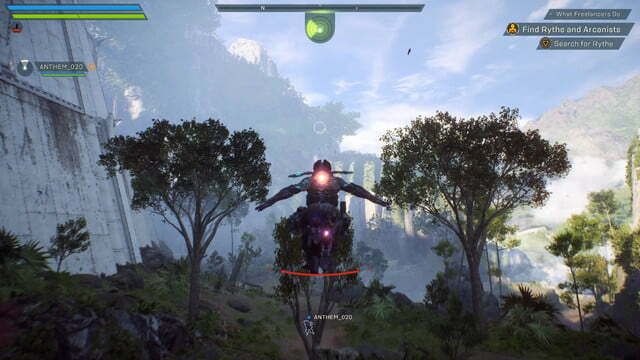 Anthem’s selection of graphics settings is a high point. Gamers can tweak a wide variety of options, from shadows, to view distance, to depth of field. That means you have more control over performance and more control over how the game lucks. Anthem is also among the few to support Nvidia’s new DLSS technology. The game’s borderless and windowed modes slightly downgrade performance, but both work well. You can smoothly alt-tab out of the game to check a guide or track down a friend on Discord. The menus, however, may frustrate PC gamers. They’re strangely laid out for a PC game, with large, chunky, awkward interface elements clearly designed for a big screen set eight feet from a couch. Annoyingly, many menu categories will show a preview of options in sub-menus, but those options aren’t available until you specifically click on the button that activates the sub-menu. This can lead you to think the game has frozen, as options are visible but can’t be toggled. What about the keyboard and mouse controls? They’re ok. The layout is basically fine, but the mouse felt more sluggish than I’d hope. That goes double when flying. The Javelins may look like Iron Man, but they fly like lawn darts. 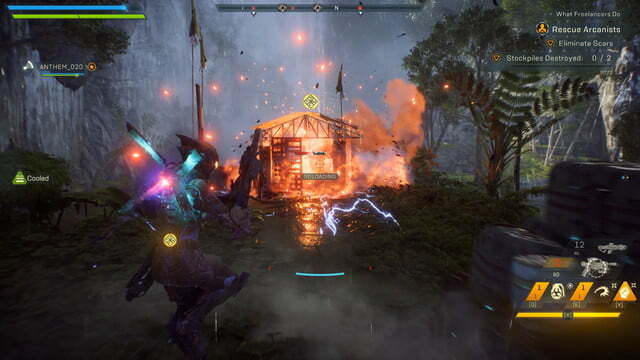 Anthem’s developers have stated they will change the PC control feel for release, but those changes won’t make it to the demo. Gunplay suffers the same problem of precision. You’ll want to stick with guns that have a long range and tight bullet spread. I found the default assault rifle frustrating because it fired wildly and reduced the need to, well, aim. All the problems above are fixed if you switch to a gamepad. It’s a simple solution and personally, I don’t mind it, but PC purists will be frustrated by the game’s lackluster feel on ye olde keyboard and mouse. There’s a lot to like about Anthem, but my time with the demo didn’t convince me that it translates well to the PC. It ran at a lower framerate than I’d hoped, load issues were frequent, and the menus were obviously designed with console players in mind. Of course, these impressions are based off the VIP demo. The final game won’t appear for a few weeks and some of these issues may be resolved, or the result of servers that are melting into a puddle. I intend to do more testing and post a full guide to PC performance closer to the game’s launch. For now, I think PC gamers should wait before forking out 60 bucks.